Cadsoft’s new Envisioneer 14 is billed as a CAD product for non-CAD people: a product so easy and intuitive to pick up that even complete CAD neophytes can use it. To see whether Envisioneer 14 lived up to its claim, we test-drove the software to build a dream house. My verdict? The platform is indeed an easy, enjoyable design tool for beginners -- but not without a few little hurdles. Currently, the home-design process is fractured across stakeholders and platforms. The fragmentation means that even after the owner or their architect, if they have one, creates the plans, different subcontractors must keep redrawing them in their platform of choice. Envisioneer is meant to be a unified creative platform that stores all of the project information, simple enough for a CAD-illiterate homeowner but detailed enough for a subcontractor to get useful information from. If professionals need to use the information on their own platforms, there's the capability to import the plans directly to the software rather than redraw the entire model. The other big selling point is that Envisioneer’s software makes it easy to see what a building is going to look like, both on the inside and in the context of its environment. 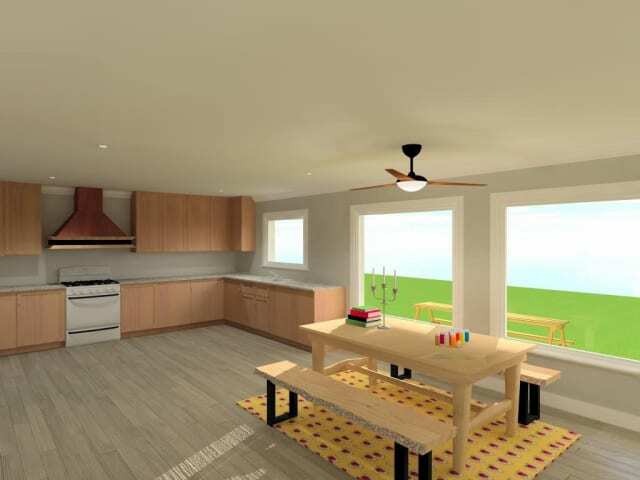 CAD-inexperienced users can create their own virtual reality walkthroughs, either to test out what their own house might look like or to advertise it to others. One of the strongest selling points of Envisioneer 14 is its various automated Building Tools. When starting a new project, the user has the option to build their entire house with a house-building Wizard, which runs the user through the floors and foundations, general building shape and garage location, building dimensions, and building elements like ceilings and roofs. After the Wizard runs, the user has what’s essentially the empty shell of a house, letting them build and decorate as they wish. If users prefer to take the long route, they can also draw out the house manually using the wall, floor, ceiling and foundation tools. Finally, if they want to manually enter certain aspects of the house while skipping over others, there are Building Tools for specific areas, like kitchens, foundations, or bathrooms (I personally used the Foundation Building Tool to save on time). 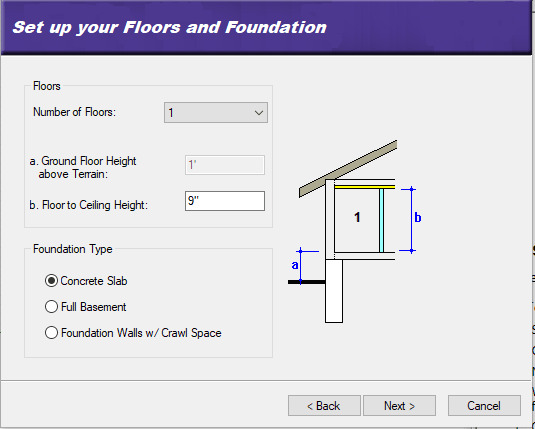 There are multiple tabs, but the most useful tab for the novice house-builder is the “model” tab, which can toggle between a 2D plan (see above), a 2D designer’s plan (which has the 2D elements in the correct color and pattern), and a 3D model the user can walk through. The 2D model is the easiest to start modeling the building in, and the 3D model is easily the most impressive view, lending itself to decorating and arranging spaces. And being able to toggle between different views makes it far easier to model: switching from 3D to 2D when the model is a little slow to load makes the building process quicker, and switching from 2D to 3D takes the guesswork out of knowing what a room will look like. Once in the 3D model, the user can choose between several different views, including render, realistic (see picture 1), render with outlines (see picture 2), wire frame, and pattern. Render view is the easiest to work in, because there are no shadows that make it difficult to see details, but Realistic is the view of choice for exporting to VR or for the in-platform walkthroughs of the house. 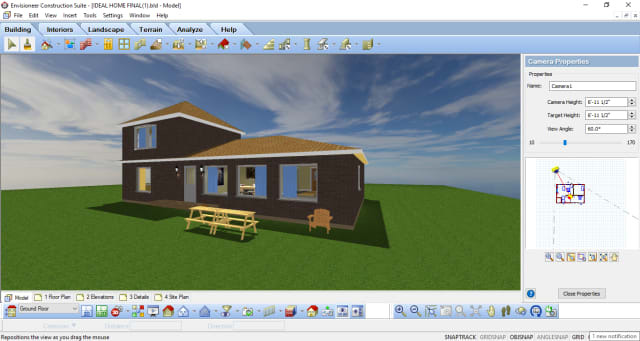 Users can go on a walkthrough of the house in presentation mode, or export a 3D view or panorama outside of the platform. Scrolling through my home model on HomeView VR. One interesting way of looking at Envisioneer files is through Cadsoft’s HomeView VR app. With the app, you can upload 3D house views as panoramas, and swipe through them as though you were actually turning around in the space. Overall, HomeView is probably one of the strongest features of Envisioneer. It makes home views available to anyone who has a phone with the app, and lets you string different views after each other to create something like a full home viewing. It also gives you a very good picture of what it might look like inside of the space, better than the view on a computer screen. The building tools are intuitively-labeled and straightforward to use, even without looking at the manual. An impressive library of elements means that users are more likely to feel pleasantly overwhelmed than hemmed in. For processes like placing walls or ceilings, there is both a fill-by-room and a manual option, depending on how detailed or irregular you want your shapes to be. The only tool that I initially struggled to use was the stair tool. While the tool itself gives a good range of options and adjustments for stairs, treads and railings, I initially struggled to cut a hole in the ceiling and floor upstairs to allow a person walking on them to go through. I found that I could cut a hole out of the floor with the floor division tool, and, with the advice of Cadsoft, I manually drew the ceiling so that I could use the Cut Opening tool to create a corresponding hole. It wasn’t a particularly hard to make the hole, but for ease of use, it stood out in contrast to the other tools. Working with the interior materials makes it obvious that the software is designed for people who care about a house’s livability. There is an almost dizzying array of materials, furniture, appliances, and décor items, and hundreds of possible colors. Users can get a very good approximation of what it might be like to live in a space, down to dishes placed on countertops and picture frames on tables. As a gardener, I was quite frankly impressed with the selection of plants it was possible to place in outdoor spaces, as well as a glossary that let the user know when these plants bloomed, where they could be planted, and what their most common decorative use was (i.e. screening, filling, etc.). My only design frustration was the difficulty I had placing certain items on tables and decks. Placing attempts were met with floating and (when I turned off clash detection) occasional clipping. The tools for navigating the 3D model are overall reliable and useful. Users can click on the navigation wheel at the side of their screen (visible in the above image) and navigate while still keeping other tools open in their main toolbar. You can immediately snap to a specific view of the house, or use the fly, turn and walk tools to change your vertical position, change your perspective, or change your horizontal position. While it could be awkward to get into the correct position, it was relatively easy to move through the model as if I were moving through physical space. 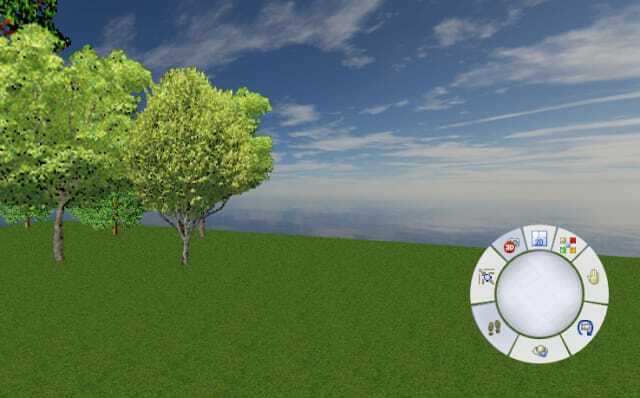 For users interested in creating a more site-accurate model, Envisioneer has a good set of tools for modeling terrain. The Hills and Trenches tools let users set the place, direction, and shape of their incline, while the Path, Concrete Pad and Retaining Wall tools model more man-made features. The tools also include an option to import site data from another platform in the form of a Triangulated Irregular Network mesh, giving users the option of a more precise site model. For a user who’s actually planning to build a house (and not just creating a fantasy house online), one of the most useful tools is the Generate Project Estimate button. It keeps track of all the materials used in the house so that the user can calculate the project's overall cost. The prices of all materials are initially set to zero, and the user can plug in how much the material costs in their local market. If one of the materials proves too costly, the tool also lets you switch out the material, wherever it is in the house, for a less-expensive alternative. 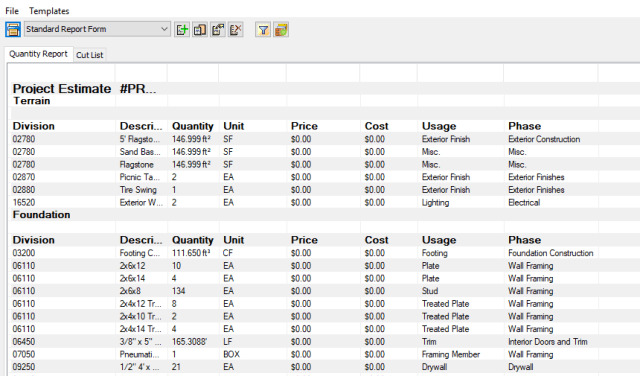 Another set of analytic tools lets users write in and store schedules for the installation of aspects like windows, doors and members. This ensures that all project information is stored in a single place, and also makes it easy to print out any necessary scheduling documents. Apart from the model tab, there are also tabs showcasing the floor plan, elevations, project details, and the entire site plan. These tabs give users the option to insert pictures and PDF files, alongside “smart views” of the site as the user changes it in the model tab. The above image is a “smart view” on the elevations tab. These tabs also include drawing and markup tools, to let different stakeholders discuss potential changes in-document. Finally, these tabs can be printed off as official documents like site maps for permits, so that users don’t have to redraw them by hand or in a different software. Combined with the analytics tools, these tabs are a powerful resource for communication between project stakeholders, and for ensuring that all project information is available in the same document. 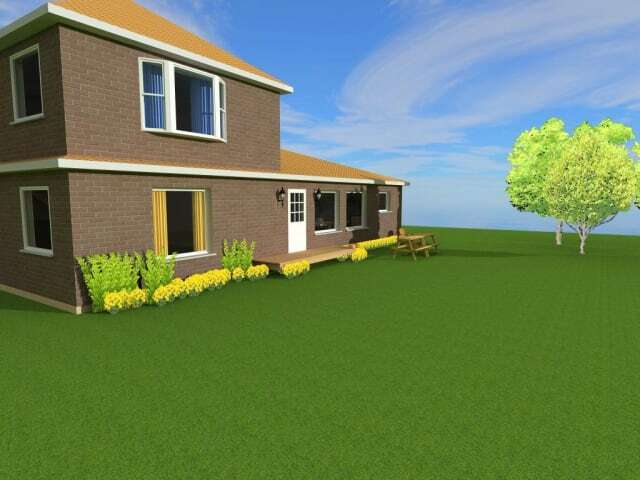 I was able to learn the software and design a modest house in about a day and a half. 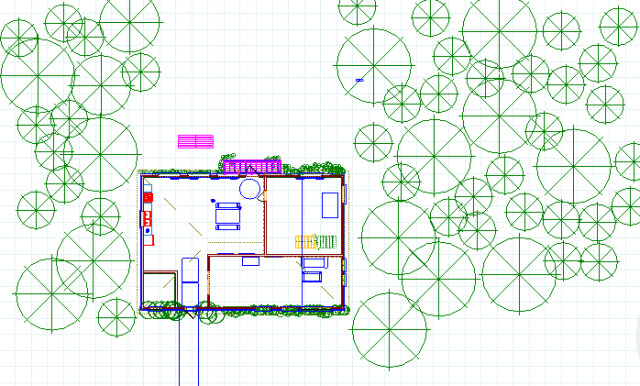 The process was visual and intuitive, comparable to designing a house in The Sims computer game, but also allowed for accuracy and structural detail. Envisioneer lives up to its promise as a CAD platform without the steep learning curve. I would recommend it for CAD laypeople interested in selling or building a home—or just interested in some entertaining exploration.